My first experience with moments of greatness was when I heard people talking about an amazing game of basketball my father had played. It was essentially a pickup game played with the other people working at the summer camp, but my dad had done some amazing shots, apparently making baskets by shooting with his back to the hoop. Later, I heard another such story: when my dad was playing baseball in high school his speed was questioned. So, he entered a track meet and set the school record for the mile wearing baseball shoes and without any training. That record stood for quite some time. I didn’t think much about such moments of greatness until years later and in a somewhat silly context. I was playing Halo 3 and for a few seconds I had a taste of nerdtastic greatness: my fingers flew like lighting, working the controller like a maestro playing her violin. Everything else faded into shadows and I had complete concentration. My opponents moved in slow motion and were effortlessly cut down by my terrible, swift, gun. I had that experience a few more times while playing Halo 3, but it was never something I could do consistently. As such, it was but a small taste of the nerdy greatness that some people must dine on regularly. I have also experience this from time to time in other games, such as World of Warcraft-I will play my character to near perfection, cutting down my opponents in PvP or handling a raid boss with ease. Of course greatness in video games is a rather lame sort of greatness. However, I have had tastes of greatness in more significant matters. Those who have followed this blog probably know I am a long time runner. I was good in college (All Conference) but never great-except for those few times when I truly ran at the top of my ability. In those moments I felt pure, eternal and complete. I and the run were all that truly existed, the other runners and the spectators were just dim shadows. That feeling is, to say the least, amazing. While I have never achieved true and consistent greatness in sports, I have been up the mountain high enough to see the peak and thus I can really appreciate what the true greats experience. I must admit that I have felt a small twinge of jealousy and some regret-like a minor hero gazing up to Mount Olympus and seeing the gods dwelling in unreachable greatness. I have also felt this in my other endeavors, such as teaching and writing. I have cranked out many publications, including books, but none have been great. Good, yes. Truly great…alas, no. However, I have felt that bit of greatness that one can experience while writing-the words simply flow smoothly and flawlessly, saying what I wish to say. No, not just what I wish to say-but what I should say. Great writers, can, of course, do that fairly consistently. That is what it is to actually be great-to be able to maintain that level. To be able to stay at the peak and not slide back down the mountain. It would be, I think, easy to be a bit bitter about being merely good. After all, knowing all too well how much better other people are and really understanding that they have regularly what I can only have in very limited moments can be a bit depressing. To use an analogy, it is like having a few bites from a gourmet meal and knowing that people get such a feast regularly. However, perspective really helps here. I think I have done the best I could do in most of my endeavors and there is no shame in that. While it sounds like a trite thing, what does matter is to go out there and do your very best, to know that you could not have done any better. Not in the sense that you fell short, but in the sense that you rose to such a height. There is great honor in doing this, more than merely doing well but falling short of what could be done. I’ve played only some of the ODST single player campaign, so I cannot render a full and proper verdict on the game. However, I have played enough to make a few comments. My main comment is this: if you like Halo, you’ll like the game. But, if you like Halo, you already have ODST and so my comment is wasted. While ODST was originally intended to be an expansion for Halo, it is a standalone game. It also includes a Halo 3 multiplayer disk, including all the maps. For most people who buy ODST, this will not be any bonus-after all, most such folks will already own Halo 3 and will have probably already downloaded the extra maps. If you don’t have those maps, the disk can be a nice extra. Also, if your Halo 3 disk stopped working (like my friend Dave’s), then getting the multiplayer disk is a good deal. In some ways, ODST does still feel like an expansion pack rather than a full blown new game. Unlike Halo 2 and 3, it does not really add anything new to the game (aside from the fact that you play a non-Spartan). As far as I can tell, it uses the exact same engine as Halo 3 (of course, that is a rather good engine). It also takes place in the city that you already played through in a previous Halo. It is also supposed to be fairly short for a full game. It also does not add anything to the Halo 3 multiplayer system. I was rather hoping that they would add ODST and other Covenant races as playable options in the multiplayer. Naturally, they would have to be balanced against the Spartans and Elites for ranked competition, but having mixed forces in battles would be rather cool. Heck, I’d play a Grunt or Jackal a few times just for the fun of it. They did, however, add a new multiplayer unique to ODST. In firefight you (and a few companions) face endless waves of Covenant. While this sounds repetitive and perhaps something that would be dull, it has received rave reviews. I haven’t tried it yet, but I suspect I will like it. One significant difference between ODST and the other Halos is that you are not playing a shield equipped cyborg. Rather, you play special forces guys. And I do mean guys-you don’t stick to one character through the game, but switch to flashbacks that you play as you find various items. For example, finding a helmet triggers a flashback in which you play the sarge in charge of your drop team (I’m guessing the inspiration for this was the “helmet” flashback in the first Halo). At first I thought that this would damage the game experience (I rather prefer to stick with a single character in a game and follow a narrative from that perspective). After all, dividing a game into various story lines runs the risk of fragmenting the game. Overall, the folks at Bungie did a good job of keeping the narrative intact. Of course, the main reason to play a FPS is the combat and, as always, the folks at Bungie came through. Playing the ODST soldiers is a bit different from playing the Master Chief. While the Chief had shields (and health in Halo 1), the ODST soldiers have Stamina and Health. When you lose stamina, you get a red filter effect in your view, plus some blurring. I found the effect extremely annoying at first and gradually found it only mildly annoying. I would prefer that the folks at Bungie had decided on another way to indicate stamina damage. Like the shield of the Spartans, you recharge your stamina by getting out of combat. Health is restored in the usual FPS way-you find medical stations to recharge your health instantly. Another difference is that rather than having a cheap flashlight, you have a night-vision element in your helmet. It works about as good as the best stuff available today, although it provides color rather than just B&W images. Fortunately, the designers avoided the annoying time limit on night vision/lights that has been a staple in many games. But, they do add an annoying twist of their own: using the night vision causes the images to be grainy and washed out. While this is “realistic” it makes the game look like it is being played with a failing (or badly set) monitor. I’m not quite sure why game designers sometimes seem a bit obsessed with creating a good looking game and then sticking it in the dark while supplying a fairly annoying way of dealing with this darkness (Doom III…). Anyone know? The same system that provides the night vision also outlines items and beings (green for friendlies, red for hostile, etc). This feature is handy for spotting enemies, but does make the game feel a bit like it is flashing back to the 1980s (when video games featured illuminated outlines rather than rendered 3D shapes). You also get a in game map and the ability to set a way point. Plus, you do get directional hints which are handy because the city is a maze. 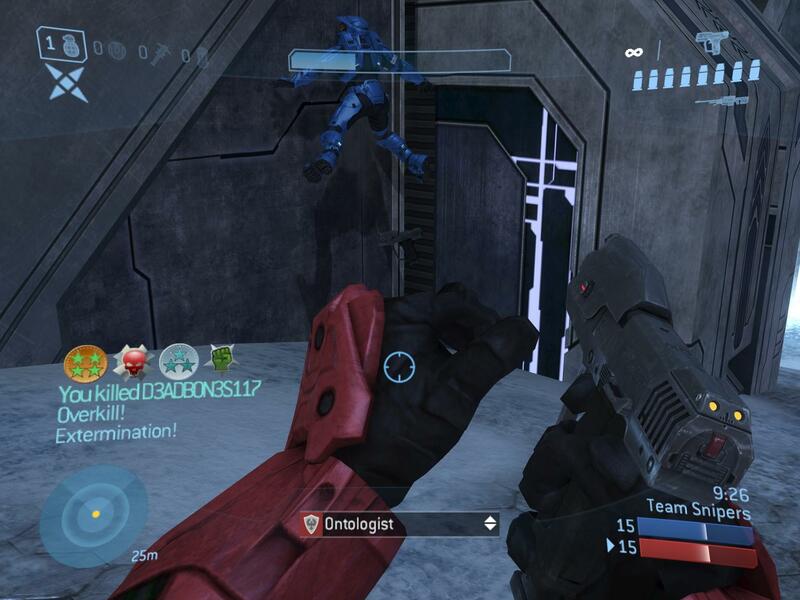 Interestingly, as an ODST you can flip warthogs like the Master Chief. Given the size of these vehicles, I can only assume the “S’ in “ODST” might stand for “steroids.” The ODST are also capable of dealing good melee damage. In Halo I got in the habit of dealing with shielded targets by mixing shots and melee. The same works in ODST. I’m looking forward to playing more of the game, but for now I’ll be grading papers.